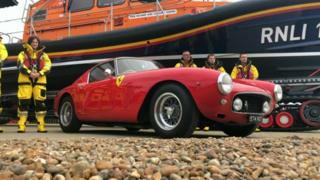 Two rare Ferraris, donated to the Royal National Lifeboat Institution, have helped raise £8.5m to buy two "revolutionary" lifeboats. Northamptonshire businessman Richard Colton left the cars to the charity after he died aged 82 in March 2015. The RNLI has named one of the boats after Mr Colton and his late wife Caroline. Peter Adams, from the Hastings RNLI, said: "It's wonderful that people hold the RNLI in such high esteem." A 1960 red Ferrari 250 GT SWB sold for £6.6m, while a silver 1967 Ferrari 275 GTB/4 sold for £1.93m at auction in October 2015. Phil Jones, coxswain of one of the boats in the East Sussex town, said the two jet-propelled vessels had "revolutionised all-weather lifeboats". The £8.5m was raised by the sale of the two Ferraris, a Jaguar E-Type V12 Coupe once owned by football star George Best, and a 1976 Jaguar XJ-C 12, as driven by John Steed in the 1970s TV series The New Avengers. Mr Colton's godson Charles Denton said his godfather would have been "amazed at how much money was raised" and described the new lifeboat as the "Ferrari of the seas". He said Mr Colton was "a shy and private man" who had no particular connection to the charity but "wanted to leave a legacy". He said the businessman, who was from Stanwick near Rushden, "loved technology" and would have thought the new lifeboats were "absolutely wonderful". It is the largest donation in the RNLI's history. The official naming ceremony will take place on 27 April and the public can attend.